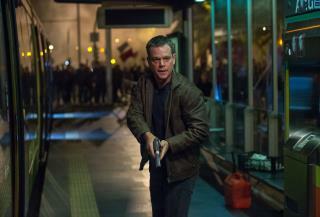 Bourne films are light years ahead of the constant Hollywood recycled crap.. Here's what I "liked" about the Bourne movies: the guy is so brilliant that he can figure out, just off the cuff, exactly how far he can run at any given altitude before he starts breathing hard, but for some reason it doesn't occur to him that after beating up a parade of Swiss police and US embassy guards and Marines that maybe he should take a minute and trade the big red bag from the bank for something a little less conspicuous. The creative high point was when he jumps down a stairwell and uses a corpse to cushion his landing.